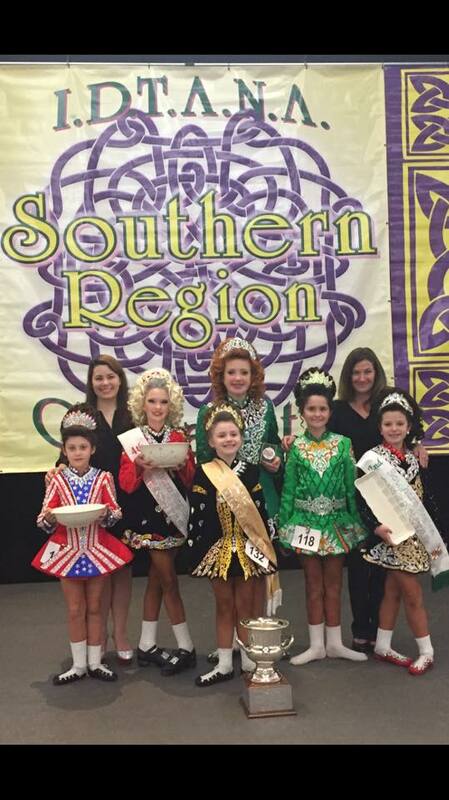 Aine Callahan, an 8-year old dancer from the McGrath Academy of Irish Dance, claimed top honors at the Irish Dance Teachers Association of North America (IDTANA) Southern Region Oireachtas in Baltimore, Friday, Dec.2 through Sunday, Dec. 4. The Oireachtas (pronounced Or-ock-tus) is a regional championship where Irish dancers compete to qualify for national and world championships. The southern region, of which McGrath Academy of Irish Dance is a member, includes Alabama, Arkansas, the District of Columbia, Florida, Georgia, Louisiana, Maryland, Mississippi, North Carolina, Oklahoma, South Carolina, Tennessee, Texas, Virginia, West Virginia and Mexico. Nearly 2,000 dancers from the southern region competed at the Hilton in Baltimore. Aine Callahan, daughter of retired Air Force Master Sgt. Steven and Shannon Callahan, beat 51 dancers to bring home the first place perpetual trophy, which was won last year by another McGrath dancer – Reilly Savage. Callahan started dancing when she was 5. “My mom asked me if I wanted to try Irish dance,” she said. Her mother hasn’t missed a chance to watch Aine compete since she started in 2014. As awards were announced in Baltimore, Aine stood onstage with nine other dancers, waiting for her name to be called. Eventually, just two dancers remained waiting center stage. When her name wasn’t called for second place, it took a moment for her to realize that she had won it all.